FEATURED MULTIRACIAL KID: MEET KARSON! My Dad is African American and grew up in Texas. He is planning to take a DNA test to see if we can find out more about where in Africa his ancestors came from. My mom is White American and most of her ancestors are from Scotland, Ireland and Germany. She grew up in New Jersey and Ohio. We moved to a suburb of Cleveland, Ohio this summer. We live in one suburb on the west side of Cleveland and I travel almost an hour each way to go to school on the east side of Cleveland. The town I live in is not very diverse, but my mom lived here as a kid and she said it is much more diverse than it used to be. Thankfully the school I go to is very diverse. It is a private school and the community places a lot of value on diversity. My family also belongs to a very diverse church that is like a big family to us. I was born in New Jersey and lived there until we moved to Ohio this summer. My town in New Jersey, also was not very diverse. I went to public school there and unfortunately the highest performing schools were not in areas with a lot of diversity. But we did belong to the same family of churches there and that is where most of our closest friends were and that is a very diverse group of people. There were very few multiracial kids in my school, but lots in my church. My mom was a college student and my Dad was playing football for the Cleveland Browns and they met when my dad was out for a jog and stopped to visit a friend and my mom was at her house. They dated for six years before they got married and now they have been married for 26 years! Both of their families were against them getting married, but after a couple years they all came around. Some people thought their marriage wouldn’t last but obviously they were wrong. Yes. I am the youngest of my parents’ three kids so by the time I came along everyone was over it. DO YOU CELEBRATE TRADITIONS FROM BOTH SIDES OF YOUR FAMILY? We definitely celebrate traditions from both sides of my family. My Dad taught us about things like Juneteenth and we celebrate the religious holidays more like my mom did growing up. But we have made a lot of our own new traditions too. My dad cooks breakfast burritos on Christmas morning, we celebrate Christmas eve with Chinese food and a game of spoons, we go out to eat for family birthdays and things like that. ARE THERE MULTIPLE LANGUAGES SPOKEN IN YOUR HOUSEHOLD? Unfortunately we only speak English at home but my sisters studied Spanish in school and I am studying French. I really would love to learn many languages. To me that is the best way to really be able to learn about different people and cultures. It is cool being multiracial because I feel like I can fit in everywhere with everyone. I’m comfortable with all kinds of people from all different backgrounds, racially, economically and all kinds of ways. WHAT ACTIONS DO YOUR PARENTS TAKE TO TEACH YOU ABOUT YOUR DIFFERENT BACKGROUNDS? My parents always taught us that it was our hearts that mattered. Our race was a small part of who we are. My sisters and I became youth advocates not because our race is the most important thing about us, but because we believe all people should be treated well and should feel great about who they are. DO YOU TALK ABOUT RACE A LOT IN YOUR HOUSEHOLD? 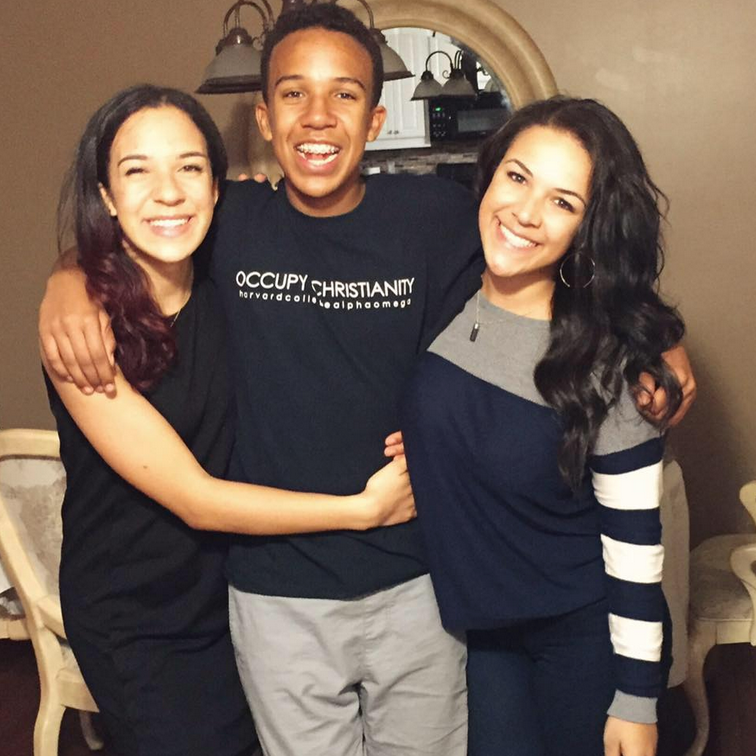 Being the youngest, I probably heard a lot more talk about race than my sisters did growing up. My oldest sister became president of Project RACE Teens when I was four! She was holding minority focused bone marrow drives when I was six or seven and explaining to me how important it was that multiracial people were represented in medical data. Both of my sisters won the Princeton Prize in Race Relations two years apart. My second sister was the only youth member on our county Human Relations Commission. My oldest sister writes a lot about race. She wrote a piece about Tamir Rice that was seen by close to 100,000 people last I heard. My other sister is a junior at Harvard and tells me a lot about things she learns about race in her classes there. So, yeah, there was and is quite a bit of talk about race, all very positive and focused on what we could do to help. Now that Kayci and Kendall have gone to college and it’s just my parents and me left at home, we probably talk a little more about sports than we do about race. I do, but I use the term multiracial. Someone once told me that “mixed” sounded like you were mixed up or impure and that kind of stuck in my mind. I am the President of Project RACE Kids and we use the term multiracial. Not at all. I actually haven’t been on a date yet. I am happy with who I am, but my race is a small part of that. I am mostly proud of myself because I always try to do the right thing and give my best, not because of my race. It’s really not something my friends and I talk a lot about. ARE THERE ANY COMMENTS YOU ARE REALLY TIRED OF HEARING FROM PEOPLE IN REGARDS TO RACE? Sometimes people say racist things without seeming to even realize they’re doing it and that is kind of scary because your racism has to be pretty deep if you don’t even see it as racist. I hate when people argue that there is no racism or that there is no such thing as white privilege..
For multiracial people to be the majority would be cool. But even better would be for race to be something that people hardly notice.